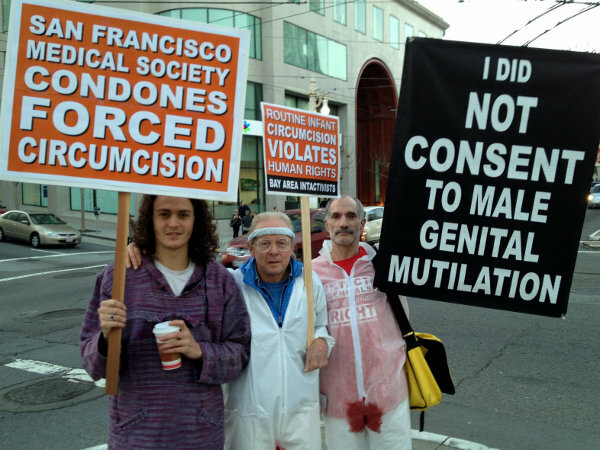 Human rights activists with signs and faux blood-stained clothes flanked the entrance of the Concordia-Argonaut Club on the eve of the San Francisco Medical Society's 2013 annual dinner to protest the physicians' opposition to the San Francisco Male Genital Mutilation Bill. 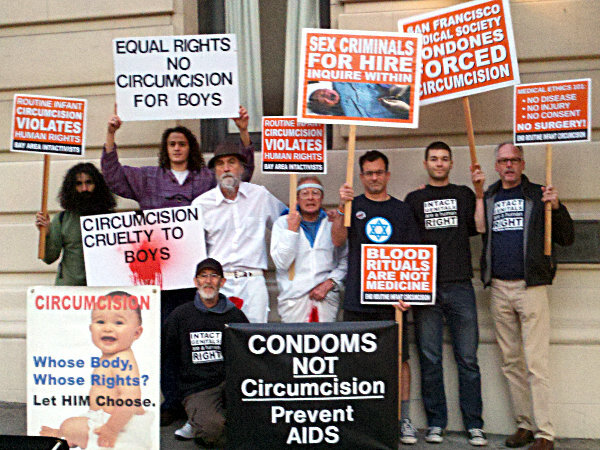 The ballot initiative, which garnered the support of over 12,000 San Francisco voters, sought to restrict non-therapeutic circumcision to consenting adults. Despite one of its stated goals being the advocacy of patient rights and the responsibility of its members to adhere to medical ethics, the San Francisco Medical Society endorses the genital cutting of healthy male minors without the consent of the patient or any medical diagnosis. During the protest, members of Bay Area Intactivists pointed out that the medical organization's position on routine infant circumcision lies in awkward contrast to that of national medical organizations around the world, none of which recommend routine infant circumcision.